TRIVIA of Noh : Q36 : What do the pillars around the Noh stage signify? | Home | Trivia | Q36 : What do the pillars around the Noh stage signify? What do the pillars around the Noh stage signify? Each of the pillars on the four corners of the Noh stage has its own name: When you are in the front section of the auditorium, clockwise from the far right corner, the four pillars are called “fue-bashira, ” “waki-bashira (or daijin-bashira),” “metsuke-bashira (or sumi-bashira),” and “shite-bashira” respectively. 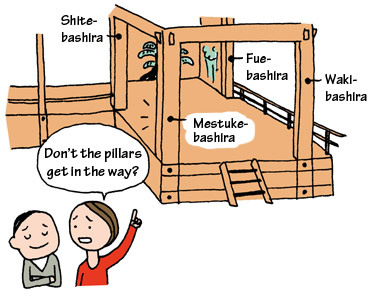 The near left pillar, or “metsuke-bashira,” seems obtrusive because it obstructs the view of the audience. When a stage is outside, it requires pillars to support the roof; but when it is in a building, you may think that the roof can be suspended from the ceiling as those above the sumo ring. However, we do not eliminate the pillars because each of the pillars has its own function; for instance, the metsuke-bashira is used as a landmark for leading actors. Yet actors actually find their positions by considering their strides and the direction of their toes, not necessarily by the metsuke-bashira. In Noh theatres, we use four pillars to separate the space and strongly impress the audience with the world expanding in all four directions, as well as let them concentrate on the stage. The obstructing metsuke-bashira may be necessary for the audience, rather than for the performers, to maintain the state of tension in front of the stage.